I fear we are raising a generation of very smart, but very boring, people. We've entered an era where students live by numbers. Two numbers, specifically: test scores and GPAs. Thanks to the dangerous emphasis on testing, we've completely changed our approach to education. We've hacked apart teaching strategies and, picking up the pieces, created Frankencurriculums whose sole purposes are to get kids to score well on tests. Gone are the days of simple schooling (which, by the way, did previous generations quite well, thankyouverymuch). Today, kids are pressured to memorize test-related facts and gobble up as many Advanced Placement (AP) courses as possible. In today's school system, AP courses are weighted more heavily, so kids in some schools can now push past a 5.0 GPA. Some step into higher level AP courses beyond their ability, opting to struggle for a B or C over excelling in a "lower level" honors classes just so they can get a better GPA. Schools are now education machines, popping out over-tested, GPA-eating, Valedictorian-seeking robots. Currently, many schools base Valedictorian on the best GPA. Unfortunately, thanks to the weighted system, kids who take "average" academic and honors level classes will never be in the running for this esteemed position. But why? Who are we to say that the kid who worked hard to do well in their AP classes are somehow better, rather more valuable, than the kid who worked equally hard to achieve similar grades in academic level classes? This endeavor has not been without an emotional cost. Mental health and anxiety disorders are steadily on the rise in school-aged kids and teens, with the pressure of taking AP courses and testing being at the forefront of causes. 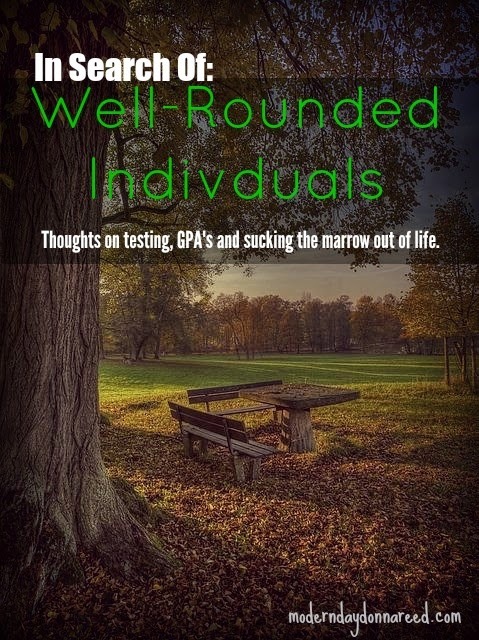 For years we've seen the destructive nature that standardized testing is having on our youth, with parents finally taking a stand and working on opt-out campaigns. And we cannot ignore the detrimental outcome of the stress placed on our kids. This recent article in the NY Times was eye-opening, bringing to light the stress endured by teenagers and the rising suicide rate among school-aged kids. There is an educational cost to consider as well. Among the classes that lose out in the GPA weighting system are electives and art classes. Kids now have to face the choice of taking harder classes (more pressure) over "less valuable" electives such as public speaking, art, cooking, technology education, creative writing, photography and child development. We see the trend of "the arts" getting cut from school offerings all together. Our school curriculums are all intellectual rigor and no creative exploration. 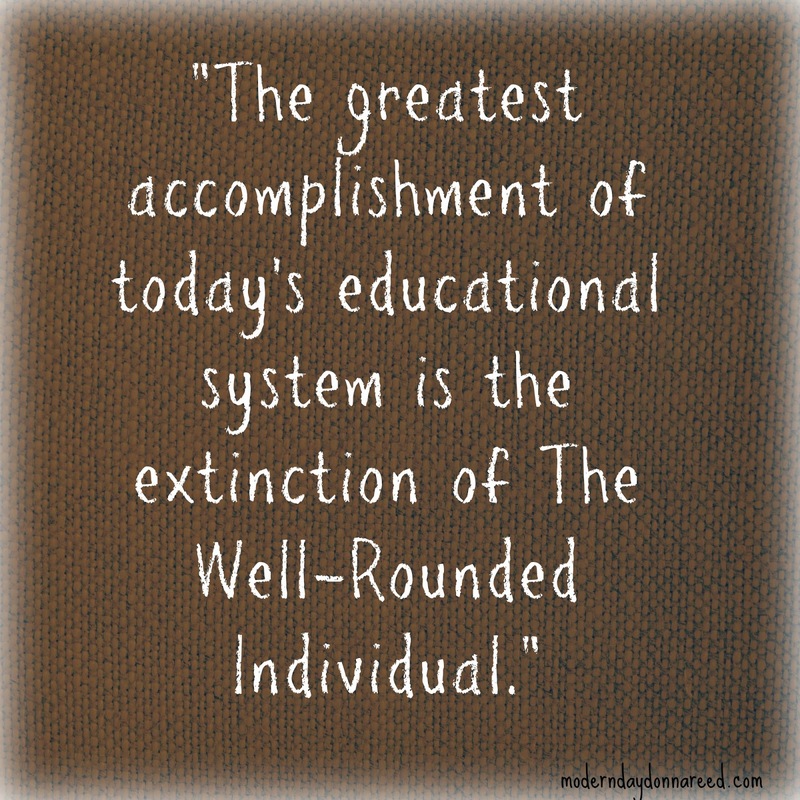 The greatest accomplishment of today's educational system is the extinction of The Well-Rounded Individual. In an effort to thrive, we've stopped letting kids be. And as previously discussed, at great cost. We've stopped encouraging the exploration of creativity, art, poetry, sports. Instead we've focused on making sure kids can come up with the correct answer on mandated tests. But for what? What is our end? Getting into a good college? And working so hard, so unhappily, that we can never enjoy the life we've built. This is the definition of happiness that we are teaching our kids. 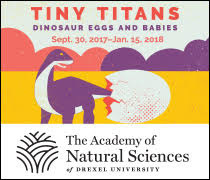 So, instead, we are raising a two-dimensional generation who cannot appreciate the strokes of an artist's brush, the beautiful harmonies of a conductor's baton, or the melancholy of a sonnet. Beauty is only something understood if it spits out a higher GPA or the correct answer on a test. We are creating humans programmed to lead boring, lack-luster lives. Intelligent and efficient? Sure. Successful and of monetary value? You bet. But devoid of depth, breadth and humanity. If there is anything I can dream for my kids at this point in our world, it is to be experience as many things possible, even if it is at the cost of being average. I want them to know what it means to be moved by a thought, a melody, an emotion. To know love, beauty, truth, depth, empathy and understanding. At the end of their lives, my kids may not be able to say they had an impossibly high GPA or scored well on state-mandated testing. But, if I do my job as a parent just right, perhaps they can say they truly lived, deeply, and sucked out all the marrow of life. That they will look back over their lives, full of wonder and adventure, and say they are happy. Cheers to the average well-rounded individuals.